To speak in an Augustinian register about the love of God working with our free will is to use the imagery of the elect Christian as a wounded man being helped to cross a road that he wants, but is unable, to cross, unaided.7 Of course, this ‘external’ support for the morally corrupt is really internal support, and a moral cripple requires not just the healing of a limb but the restoring of the whole personality. This journey of healing is one in which the baptised Christian must “remain an invalid,” living life in a “precarious convalescence in the ‘Inn’ of the Church”8 until, in the distant future, his body is transformed. By the 390s it is clear that Augustine’s emphasis is more and more on the darkness of human experience and that the journey to Christ-likeness would never be complete until the Christian enters peace in the ‘City of God’. The life of the Christian would always have, according to Augustine, “a streak of ugliness that seems to endure no matter how well we learn to control our speech and actions.”9 It is at this point that Augustine’s doctrine of grace seems to me to not only be morose but does not offer a sufficiently robust doctrine of sanctification in the present and seems to ignore the opportunity to know God’s (albeit partial) healing now for the human psyche. It seems that Augustine’s doctrine leaves little room for each human being, whilst corrupted by sin, to also reflect and bear the image of their maker. 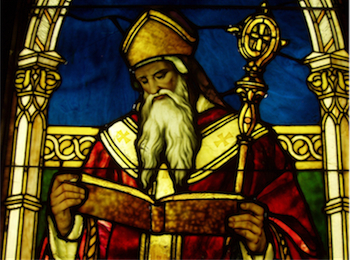 ← Saint Augustine: are we babies or sons of God?